Protecting your car wash against the liability of slips and falls is becoming an increasing concern for business owners with car washes in cold climates. If you are in an area that receives heavy precipitation, keeping up with snow and ice removal means constant maintenance. Even the overspray from a car wash can create dangerous walking areas in and around each bay. The easiest and most effective means of removing snow and ice is not the use of chemicals and salt, (which oftentimes customers are visiting your carwash to remove), but by installing a radiant heat snow melting system beneath the surface of the concrete drives and walkways. It is wise to heat 3-4 feet on the entrance and discharge aprons, as well as customer walkways and areas. If you are looking to invest in a car wash in a cold climate, or have already done so, you are probably already aware that your wash should not go without an embedded radiant heating system. The demand for safe car washes has become a serious topic due to preventable accidents and expensive settlements in recent years. Automatic snow melting systems are great investments for self-serve car washes, not only for safety, but by increasing your customers’ satisfaction. You will be able to sleep easy knowing that at any hour of the day dangerous snow and ice will be removed, making your employees and customers as safe as possible. Most automated snowmelt systems operate with the use of a sensor, which automatically activates when snow fall and precipitation are detected and approximate temperatures are below 39 degrees Fahrenheit, melting the snow before it ever has a chance to build up. Because the system is automatic, maintenance to remove snow and ice is completely eliminated anywhere the system has been installed. The quickest installation of this type of system should be done before the concrete has been laid, but there is also a means of installing the snow melt heating cables into existing concrete by using concrete saw-cut technology. Eliminating the use of chemicals, salts, snow removal devices and ice on the concrete, will increase the concrete’s longevity and keep your carwash looking new for much longer. Good insurance is a necessity for any business owner and an important step in getting legally protected. Good insurance comes at a high cost, and decreasing your chances of liability will decrease your cost. When comparing the cost savings for insurance and the decreased chances of an expensive lawsuit, there is no question that installing a radiant snow melting system is a must. If you are faced with the unfortunate circumstance of a lawsuit, any preventive action on your part will be a huge help in building your case. Warmzone’s newest line of products has everyone sitting down – and that’s not a bad thing! What goes better with a radiant heated bathroom than a heated bidet? We bring you a coupling that provides the ultimate in efficient home heating: ComfortTile floor warming systems and premium high-tech luxury bidets. What more could you ask for? 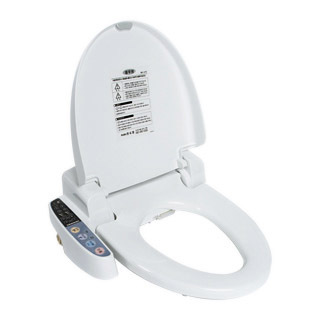 Photo of bidet with heated toilet seat. Premium bidets with heated toilet seats have been popular in Europe and Asia, and are now making a splash in Northern America. An increasing number of hotels and resorts are installing them in their luxury suites to attract customers seeking upscale amenities. Warmzone wants to offer these quality bidets to you – at an affordable price – because we all should have a little luxury in our lives. Heated bidets not only provide luxury for home owners, but can enhance your family’s style of living by offering improved hygiene. Because of the potential health benefits, heated bidets have found a niche in the healthcare industry. Bidets enhance the level of comfort and care for patients, and in particular, can grant the elderly with renewed independence and greater self-esteem. Warmzone offers a variety of quality bidets with heated toilet seats as featured on www.heatedbidet.com. The bidets include standard features such as multiple-function cleansing nozzles, power-saving heat sensors, and adjustable water and seat temperatures – all at surprisingly affordable prices. Models with built-in warm air dryers, deodorizers and massage modes are also available. In addition to the health benefits of bidet use, ComfortTile radiant floor heating systems also offer health advantages. 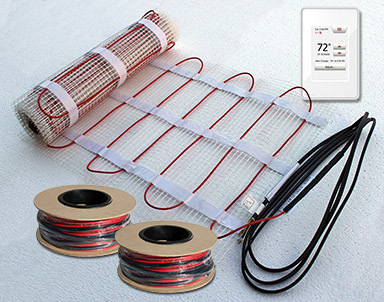 ComfortTile floor heating mat, cable and programmable thermostat. Allergy sufferers will appreciate the ComfortTile radiant floor heating system because it does not require forced air, which spreads dust, pollen and other particles into the air. A radiant heated room warms almost instantly, beginning at the floor and rising upwards. Radiant heated bathroom floors are particularly popular among home owners. Placing CT heating cable beneath the flooring results in comfort that must be experienced to be fully appreciated. Typically, consumers who have installed a floor heating system claim that they will never go without radiant heated floors again. Most home owners discover the comfort and economic benefits of radiant heat after installing a system in the bathroom, and soon afterwards want the same comfort throughout their homes. These are just two of the many products offered by Warmzone that are centered around making your home as luxurious as an expensive resort. Pamper yourself with the comfort and convenience of a heated bidet and warm radiant floor! You probably know how outdoor radiant heating cable is installed before pouring the concrete, but what happens when you want to install it in existing cement? That was the problem Warmzone needed to solve for Lockheed Martin, an advanced technology company located in Denver, Colorado. Lockheed Martin has a 5500 square-foot ramp accessing a rooftop parking garage. The concrete ramp proved difficult to plow in the winter, and costs to maintain the structure had grown increasingly expensive. During the day, some snow would melt, but the water would re-freeze at night, creating stress on the concrete and making it difficult for employees to access the parking lot in the morning. Warmzone’s ClearZone snow melting system proved to be the perfect solution, and installers from Silver Leaf Home Improvements in Montrose, Colorado were up for the job! The solution was simple. Using concrete saw-cut technology, grooves were cut into the ramp from edge to edge at 4-inch spacing. The ClearZone 480 volt, three-phase radiant heat cable was then laid into the grooves and sealed into the ramp using an epoxy topcoat. Before the epoxy cured, Silver Leaf applied a sand broadcast on the surface to create added traction and safety to the ramp. The end result was a radiant heated ramp with an automatic sensor to activate the system during bad weather – good news for employees of Lockheed Martin! Not only does the ramp require less maintenance with the new radiant heat system, the lifespan of the ramp has also been extended! Plow systems, snow melting chemicals and expanding ice weaken and crack cement, significantly shortening its lifespan. Lockheed Martin was thrilled with the results and the outstanding installation work performed by Silver Leaf Home Improvements.